Pilot Vanishing Point (Capless) Fountain Pen Review – Pens! Paper! Pencils! 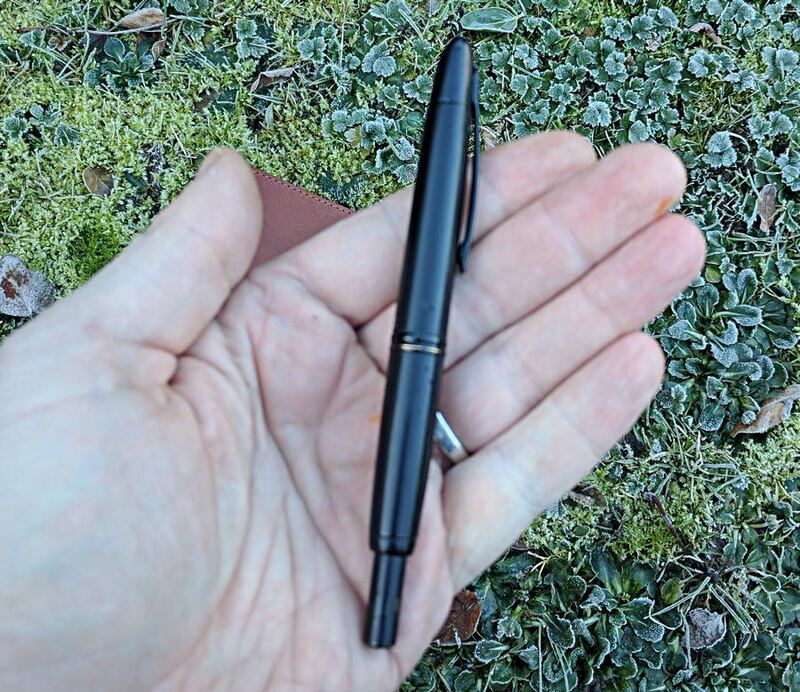 The Pilot Vanishing Point, known as the Capless in the UK but nowhere else, is a retractable fountain pen. 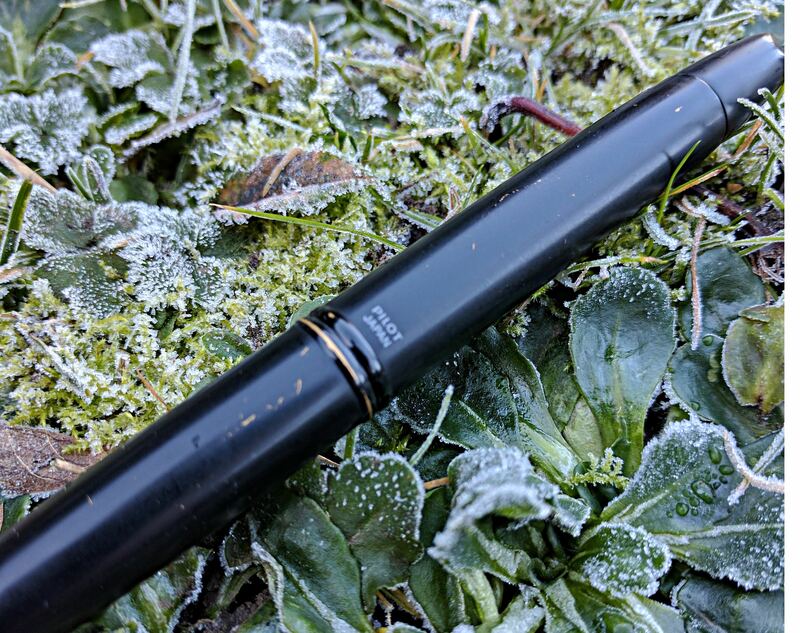 There are very few other retractable fountain pens. Visconti make the Pininfarina Carbongrafite for the rather staggering price of just under £1400 and Lamy make the Dialog 3 for £250, although it’s occasionally available at WH Smith for less than half that if you don’t mind a medium nib. The Vanishing Point sells for £150 in the UK and $150 (around £120) in the USA (or in the UK on the grey market). This means, basically, that it has little realistic competition in the admittedly rather niche retractable fountain pen category. I was able to purchase my version for a reasonable sum due to it having a few light scuffs to the finish. This suited me because I wanted to have a pen for work that would be fun to write with but that I didn’t need to be too precious about. Buying a pre-scuffed pen took away any possible stress about adding a few more dings. As you can see, the matt finish on this pen is rather prone to coming away. I like this worn and used look but this is definitely not the version to buy if you want your pen to remain in pristine condition. There are many other finishes you can choose from if you want something a little more robust. Looks are of course subjective but I do think the Vanishing Point is an ugly looking pen. The knock is long and the nib end looks weird because it’s stubby and has the clip there. The clip is placed at this end so it’s nib up when in your pocket, reducing the chances of leaking everywhere. This placement means you have to place your fingers around it when you write. This makes the grip feel unnatural for many people and impossible for some. It is possible to remove the clip as a few seconds on Google will show you but it would be great if Pilot made a Clipless Capless. 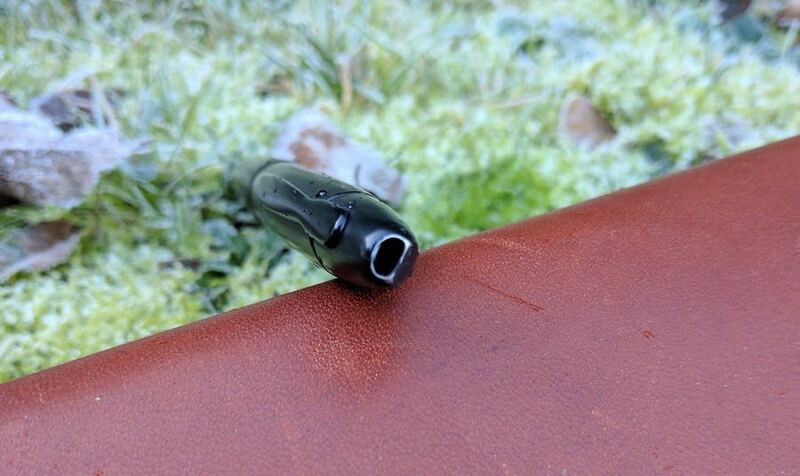 If you’re okay with the clip then you’ll find the pen to be a comfortable length and weight. The retractable mechanism is clever and works well. When retracted there’s a little trapdoor that closes over the end and stops the ink from drying in the nib. 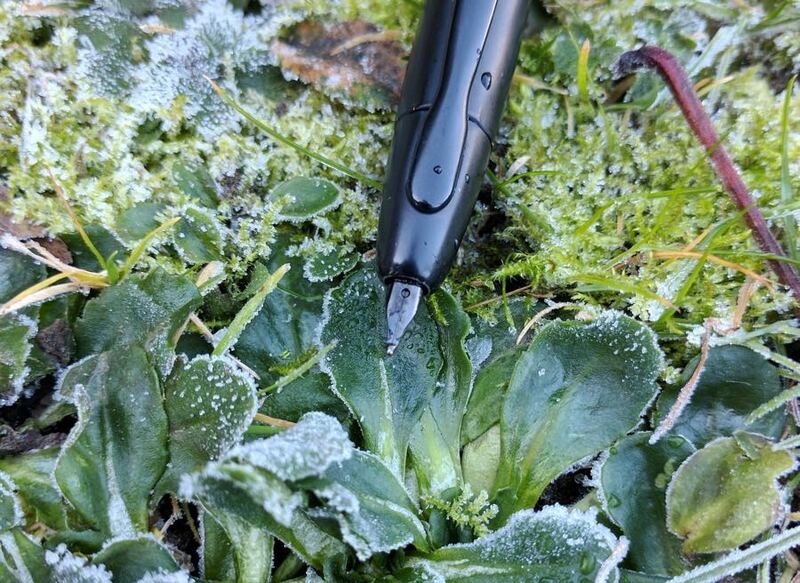 This moves out of the way when you deploy the nib, using the overly long push button. There is an incredibly satisfying click when you push this button. If, like me, you find that kind of thing deeply satisfying, the Vanishing Point is almost worth the money for that alone. 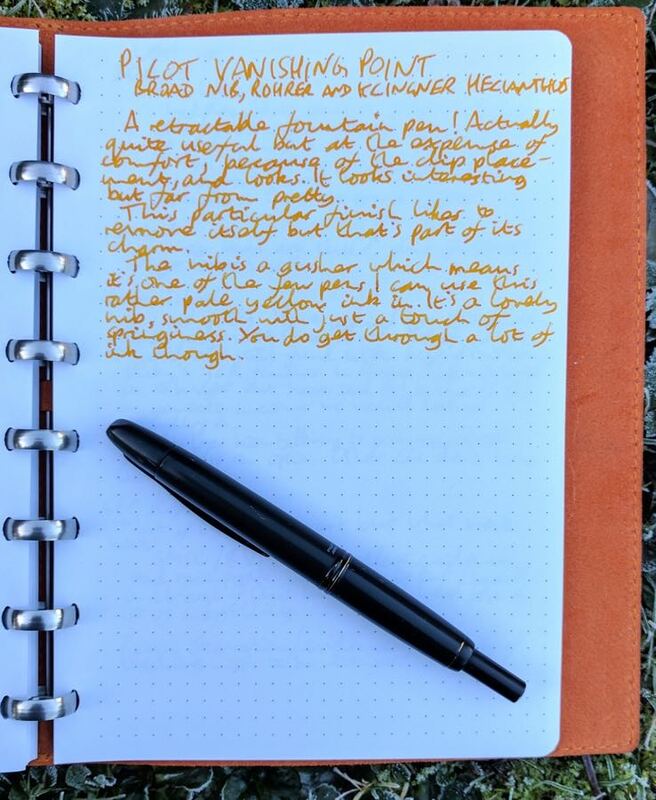 Only you will know if a retractable fountain pen is a gimmick or a useful tool. How difficult is it to pull or unscrew a cap, after all? However, in meetings where I’m taking a few notes, then listening (or drifting off) for a while, then taking a few more notes, then listening, etc etc, it does prove to be very convenient. The broad nib on this pen is like a hose. It’s the second wettest nib I own. (The wettest is on my Pilot Custom 74.) I love nibs like that, I love putting lots of ink down on the paper, but it puts some people off. It also means you get through a lot of ink and you’ll be constantly refilling, particularly if you’re using a converter. The nib’s very smooth with just a touch of springiness. It’s quite wonderful. Unfortunately if you’re using a converter it’s very hard to see how much ink you have left and as you get through so much this is more of an issue that it might usually be. For me, the Vanishing Point is a workhorse pen. It’s a lovely writer and useful in meetings. I don’t love it because I think it looks ugly but, thank goodness, looks aren’t everything. I have one in red – I agree that it’s very function focussed in terms of looks, but I’ve grown to love mine. 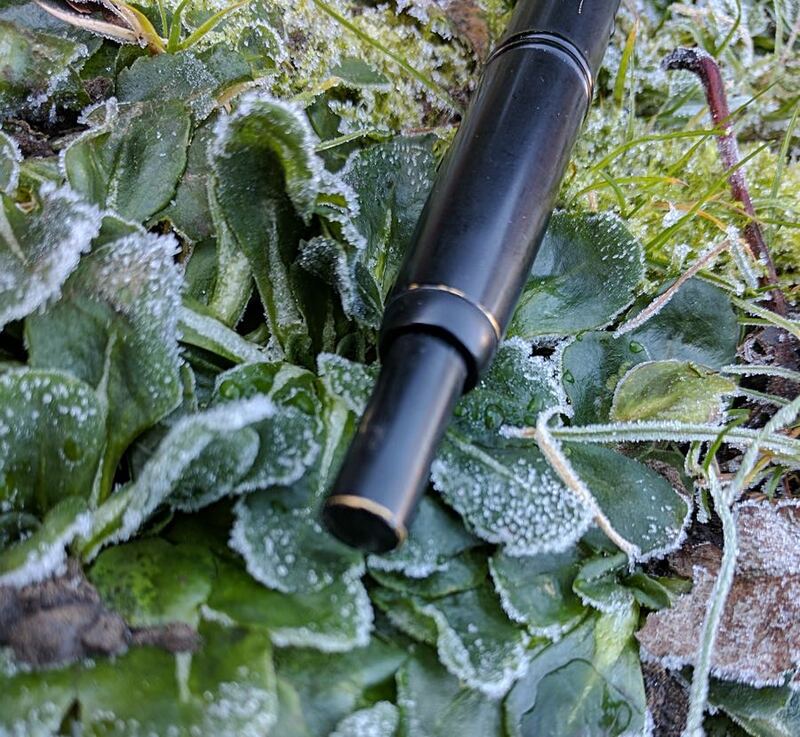 There’s nothing quite like it in the FP world, and it does what it does so well; I think, and it’s a comfortable size to write with, which is a bonus. You’re 100% right about the knock, hugely satisfying! I’ve never bothered with a converter – I’m using Pilot’s (quite nice) blue/black cartridges for now, and will refill one (probably with Pelikan blue/black, it is a workhorse pen, after all) when that box runs out. I kind of like the beat up look. 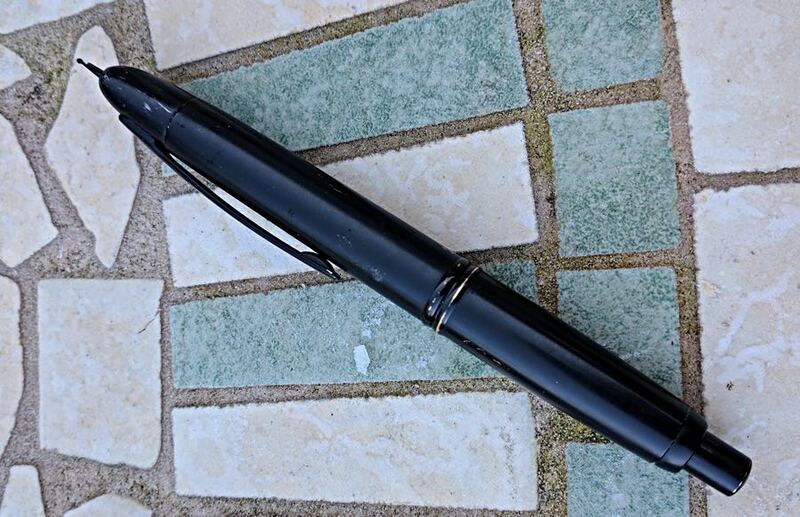 Is this the same pen as is sold as Vanishing Point “black matte”? Apparently yours has a brass or metal barrel (visible from the scratches on the barrel in your photos). I didn’t realize the “black matte” was part of the metal pen series. I have a pair of acrylic barrel VPs, but always stayed away from the metal and the all black because I knew the finish was prone to scratching and wear. (Maybe they should sell it with a piece of sandpaper so you can inflict your own wear). Neat. Yes I think it might be that one but as I bought it second hand I’m not certain. It does seem to have a brass barrel. I like the battered look too, just as well really! 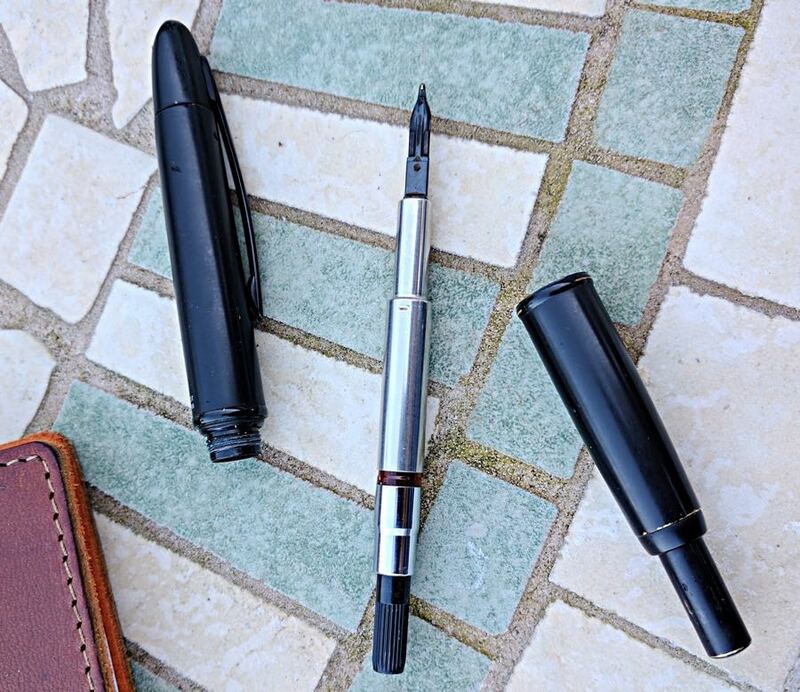 I thought I would not like these pens, but I purchased the skinny cousin of this pen, the Pilot Decimo, and it is one of my daily favorites. Between the Decimo line and the regular Vanishing Point, there are loads of style/color options.